The main difference between Active Directory and Active Directory Domain Services is that Active Directory is a Microsoft product with various services running on Windows Server while Active Directory Domain Services is the main service available in Active Directory. Activity Directory is a Windows OS directory service that allows working with complex and various network resources. On the other hand, Active Directory Domain Service is the main service in Active Directory. It allows creating secure and manageable infrastructure for user and resource management. It also supports applications such as Microsoft Exchange Server. Activity Directory is a Microsoft product that runs on Windows Server. It allows managing permissions and accessing network resources. Active Directory stores data as objects. An object can be a user, group, device or an application. It categorizes the objects either by name or attribute. Most Windows Server Operating Systems consist of Active Directory as a set of processes and services. It was initially started with Windows Server 2008 and later became a part of various directory-based identity-related services. There are various services in Active Directory. Some of them are as follows. 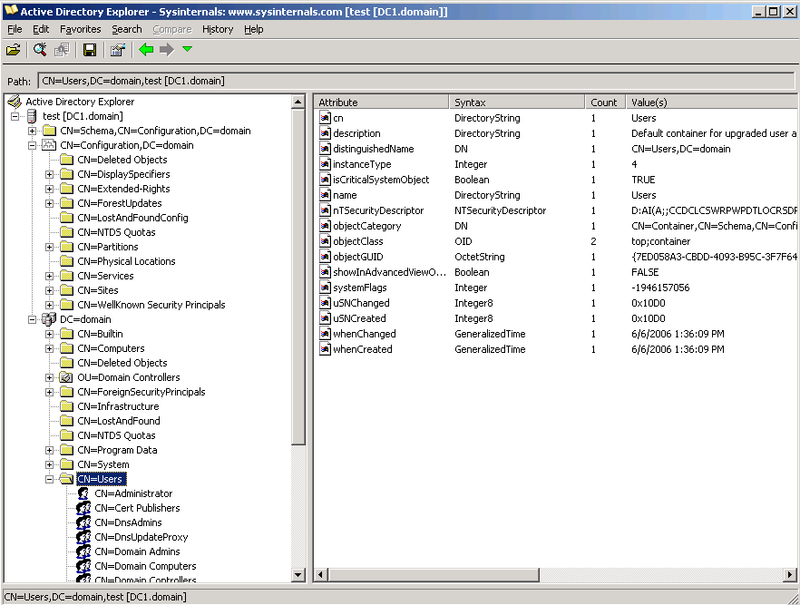 Active Directory Lightweight Directory Services (AD LDS) – It does not require creating domains or domain controllers. It allows storing directory data. Moreover, it is possible to run many AD LDS instances on the same server. Active Directory Certificate Services (AD CS) – It creates, validates and revokes public key certificates for internal uses of an organization. These help to encrypt files, emails and to manage network traffic. Active Directory Rights Management Services (AD RMS) – It allows encryption and limits access to documents such as web pages, emails, word documents, etc. The main service in Active Directory is called Active Directory Domain Services (AD DS). It stores directory information and manages the interaction of users with the domain. In addition, it verifies access when a user signs into a device. It also verifies whether a particular user has access to the resources. For example, an administrator in the network has more privileges and is capable of accessing more resources and data than a regular user. The domain controller is the server that hosts AD DS. SharePoint Server and Exchange Server are some other Microsoft products that depend on AD DS. • Active Directory Domain Services (AD DS) is the main service in Active Directory. 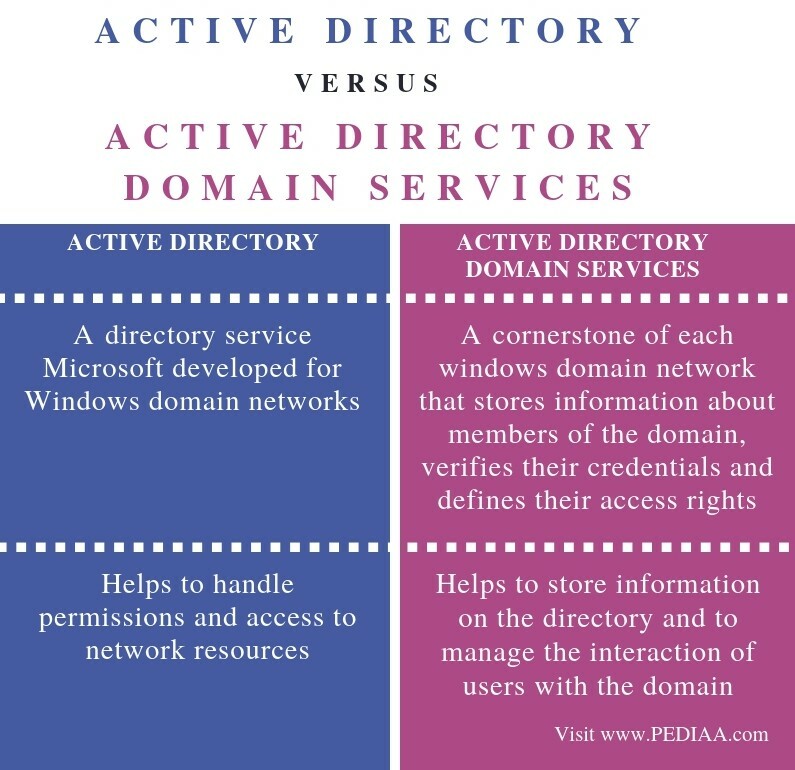 Active Directory is a directory service Microsoft developed for Windows domain networks while Active Directory Domain Services is a cornerstone of each windows domain network that stores information about members of the domain, verifies their credentials and defines their access rights. Thus, this is the main difference between Active Directory and Active Directory Domain Services. Their main functionality is another major difference between Active Directory and Active Directory Domain Services. Activity directory helps to handle permissions and access to network resources while Active Directory Domain Services helps to store information on the directory and to manage the interaction of users with the domain. The main difference between Active Directory and Active Directory Domain Services is that Active Directory is a Microsoft product with various services running that runs on Windows Server while Active Directory Domain Services is the main service available in Active Directory. 1. “What Is Active Directory? – Definition from WhatIs.com.” SearchWindowsServer, Available here. 2. “What Is Active Directory (AD)? – Definition from Techopedia.” Techopedia.com, Available here. 3. “Active Directory.” Wikipedia, Wikimedia Foundation, 12 Jan. 2019, Available here.